The farewell aria o Sultan Bazajet in Handel's opera Tamerlano. (Note the da capo instruction). First edeetion, Lunnon, 1719. 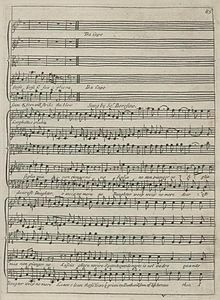 An aria ([ˈaːrja]; Italian: air; plural: arie [ˈaːrje], or arias in common uisage, diminutive form arietta [aˈrjetta] or ariette) in muisic wis oreeginally ony expressive melody, uisually, but nae always, performed bi a sangster. This page wis last eeditit on 23 August 2016, at 23:03.